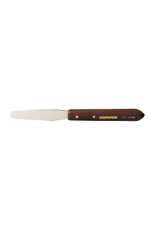 The Kemper P41 Palette Knife is made of flexible steel firmly mounted in smooth, wooden handles. The blade is 5-1/2” long. Palette Knives from Kemper Tools are used by artists and ceramic hobbyists for patching greenware, as well as grinding and mixing small quantities of china paints, oils, slip covers, and glazes.